I prefer Clinique makeup to their skincare and not suffering from severe hyperpigmentation, I passed Clinique's Even Better Clinical Dark Spot Corrector onto a friend who had been considering laser treatment for her acne scarring. I handed her the sample two weeks ago. Clinique's award winning Even Better Clinical Dark Spot Corrector has been developed by dermatologists to improve the appearance of age spots, dark spots and blemish scarring by 53%. The packaging advises that results will be visible within 4 weeks so given the length of time my friend has been trialling this for, perhaps this review is a little premature. Having said this, after just 2 weeks my friend cannot stop raving about this product. 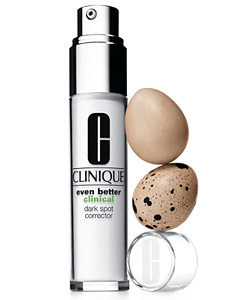 Presented in Clinique's signature sleek, clinical yet functional packaging, Even Better Clinical Dark Spot Corrector is a lightweight, unfragranced serum. A little goes a long way. My friend has been applying the product morning and evening and has noticed a significant improvement in the pigmentation, with impressive fading. She highly recommends it. At £39 for 30ml, it's not a cheap option although is considerably more affordable than a cosmetic procedure. What's more, given that the results speak for themselves, Clinique Even Better Clinical Dark Spot Corrector is worth every penny.